In my ongoing efforts to make sure my ‘eggs are in the right basket’ (see here), I’ve been seeing a nutritionist for the past couple of months. While I thought I was eating a fairly healthy diet (entirely red-meat free and mostly vegetarian) it turns out there wasn’t anywhere near enough protein in the mix. I will, and do, eat fish and chicken but I’m not crazy about them and prefer to have mostly meat-free lunches and dinners – so I’ve had to find other ways to get the protein levels up. Breakfast was the obvious place start as my previous go to (avocado and lemon on pumpkin bread) contained no protein at all so we started by halving the avocado and adding an egg. While it increased the protein level the ratio of carbohydrate to protein was still too high so (sob!) the pumpkin bread had to go. An egg by itself is obviously not very exciting so I tried a few options – egg and smoked salmon, egg and spinach leaves, and egg and asparagus spears – but I was mourning the loss of the bread and nothing seemed to add up to a worthy replacement. I persevered however with the daily egg until a couple of weeks ago when I had to go to Sydney for a work trip. On the last morning of my trip I got up early and went for a walk to find somewhere for breakfast (hotel buffets are not really my thing) and found a cute little tapas bar that had a small but interesting breakfast menu. Under nutritionist orders I obviously had to find something with eggs – and avoid any bread – so I selected eggs on Zucchini fritters which came with watercress, cherry tomatoes and pomegranate seeds. The mix seemed a little unorthodox but the flavours together were amazing. Zucchini fritters are generally made with flour so I wasn’t sure if this was any better than the bread, but figured maybe I could find a lower-carbohydrate option. A few Google searches later and I found a recipe for gluten-free zucchini fritters at thehealthychef.com– made with almond meal rather than flour and containing just 2g of carbohydrate per fritter. I found that I needed to use a lot more almond meal than in the recipe as the first batch didn’t hold together too well (see photo) – but they were super easy to make and tasted yum. They even got the thumbs up from my husband. 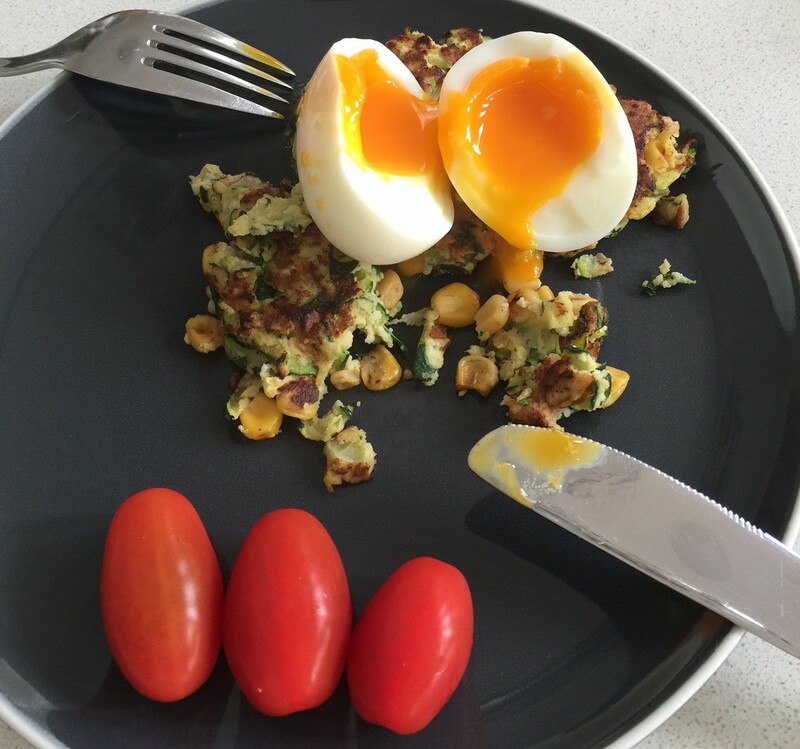 So this is now my new go to breakfast – egg (free range of course!) on zucchini fritter. I make the fritters in advance, then wrap them individually and freeze them. In the morning all I have to do is give them a quick zap in the microwave while I’m cooking my egg and voila … high protein, low carbohydrate breakfast done! Head on over to The Health Chef to get the recipe and give them a try!